Angled cut-outs accent the wood grain of the Mott Sideboard’s body, also serving as hidden handles for easily opening the buffet’s two sets of double doors. 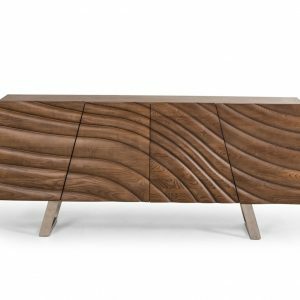 Inside, a total of ten shelves and two smooth-gliding drawers offer plenty of storage space for your flatware and other dining room needs. 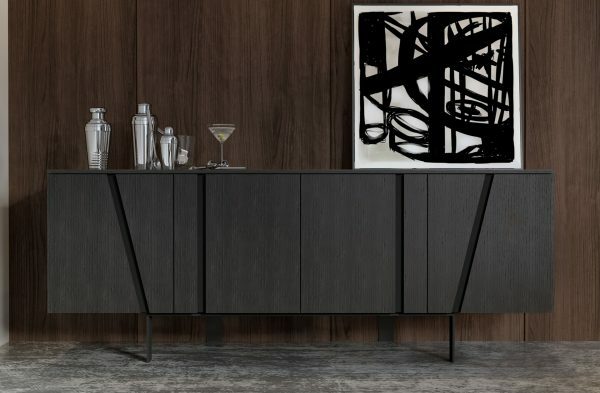 The low-profile sideboard sits on a black powder coated base with feet splayed in rotating directions for a quintessential contemporary look. Contrasting interior colors present a cool modern appearance.